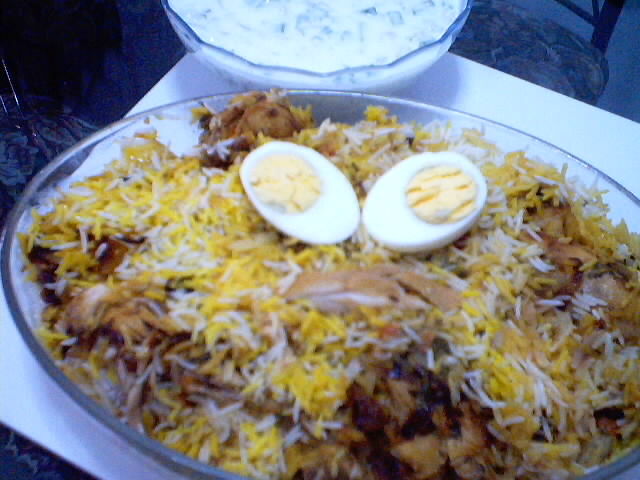 Biryani Chicken/Lamb | My Cooking Diaries "CooklikeCecilia.com"
Make a paste of red chillies, garlic and ginger. Apply to chicken/mutton with salt and set aside. Slice the onions and fry half the quantity to a dark brown and keep aside. Boil the rice in a vessel and cook till half done. Drain and keep aside. Take another vessel, pour the ghee, when hot, add the cumin, whole garam masala and the remaining onion and fry till onions turn golden brown. Add the chicken/mutton and mix well. Add the curd, tomatoes, salt and cook till done. In a deep, broad vessel, put a layer of rice, then some fried onions, little coriander and mint leaves, saffron water and evenly layer the chicken/mutton with the masala. Again layer with some fried onion, coriander/mint leaves and sprinkle with saffron water. Add the remaining rice and top with the remaining fried onions and coriander and mint leaves. Close tightly and cook on very slow flame till steam starts coming out of the vessel.